HURRY, expires soon! - Act Fast! Memberships: Best choice for those interested in attending more than 1 workshop. Membership plans allow you to attend all programs FREE! Over $30,000 in benefits included with Memberships during SALE Only! Don't feel like reading it all?,,,give us a call, we'll explain the whole thing! NEW! Sign up for a 1-Year Membership before April 19th and get additional 6-Months at no charge! NEW! Get Full Access to Empire Aesthetics XPLORE™ (reg. $1,499 annual tuition). Great new Educational tool for Aesthetic practitioners. Access special database with content such as journals, clinical trials, and receive weekly newsletters. NEW! Receive Empire-On-Demand™ (reg. 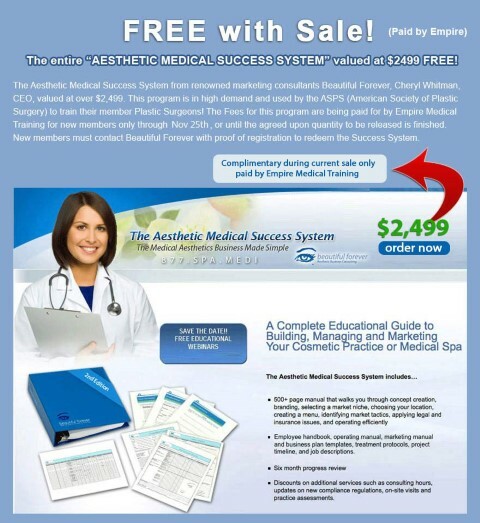 $999 annual tuition) – Online training from “celebrity” physician trainers! Educational video and procedure training. Empire ON-DEMAND™ is an online video library with key sessions recorded from our complete calendar of live workshops offered throughout the United States. These are Empire branded videos from renowned, “celebrity status” physician speakers! Never miss out on key topics from live events, best programs and topics recorded live! These are informative, educational videos taken from our top, Celebrity Physician faculty! NEW! Empire Medical Marketplace™ - Special Pricing on Dermal Fillers from MERZ AESTHETICS. The regular $35,000 initial investment that is required to participate in the MERZ PREMIUM PLUS PRICING is waived for Empire members ! NEW! Empire-Event-Apps ™ - A valuable resource for your practice and day to day activities. The APP works alongside your desktop computer and provides essential information that you will need in your practice. NEW! Empire-CME-Online-Training ™ - Empire now offers online training which you can access directly through your members portal/ Empire Events APP- These are CME accredited short educational topics in Aesthetics, Surgery, Anti Aging, and much more. PRP Training included with Diamond Membership During Anniversary Special Only! Thinking about attending PRP? Well guess what, PRP is included free with the Diamond Membership! (PRP workshop regularly $1,499, not part of membership plans) During Anniversary Special Only! "The Pain Show" discounted at $1,499 with Diamond Membership* During Anniversary Special Only! Thinking of attending “The Pain Show” Normally is $2,999 with the Diamond Membership, during Anniversary Special, Diamond Members get it for only $1,499, not $2,999! (only 1 time attendance). Membership benefits include CME, Standard Operating Procedure manual, and much more. Click here to see a complete list of benefits. Single Seminars: Best choice for those interested in attending ONLY 1 WORKSHOP. Pay only for individual seminars. Best Pricing on ALL WORKSHOPS through April 19th, Hurry! - Single Workshops starting at only $899 - Price increase April 20th. For over 21 years, Empire has been training thousands of clinicians who have been dissatisfied with training they received from other companies and individuals. As the aesthetics industry grows, so does the business of medical education, however, like all businesses, not all are qualified to provide quality education and therefore the need for retraining. Empire is proud to offer our “retrain” program which is available for any practitioner who has received training from another seminar company and is not happy with their education. With proof of prior training and costs, empire will provide up to $1,000 credit for any workshop (same topic) toward any Empire Membership (Empire-Platinum-Membership, Empire-Diamond-Membership, Empire-Pain-Membership). Call 866-366-1576 for this special discount. Membership term: 1-Year. Register before April 19th and get additional 6-Months included FREE! Empire Medical Training has the largest selection of Single Workshops to choose from with over 33 accredited CME workshops taught by qualified specialists nation-wide. * get the Early-Bird price if you register to the workshop 60 days or more before the workshop date. Gain training in the variety of pain management & aesthetic procedures we offer and choose which areas you wish to integrate within your practice. Our faculty of Pain Management & Aesthetic Specialists will assist you in learning these in-demand services at your office and give you the standard of care needed to perform these procedures safely within your practice. Empire has pioneered this type of training and has been offering preceptorships for over 21 years. Learn to Perform any or all the most common Cosmetic Procedures From only the best Physician specialists in their field. Work one on one With an experienced, qualified physician at your office. Call Today to set up your preceptorship with our Anti Aging Faculty . Empire Medical Training works with only the best, most credentialed Physicians and specialist in their field. Meet with Dr. Roberts, who is a Yale Graduate and residency trained from Johns Hopkins and the Mayo Clinic and we will arrange to have her train you, one on one in your office. Start your own Hair Restoration Practice or expand your current operation! You will visit our Physician Partner and spend the day (or days) with him at his treatment center to learn the latest non-surgical medical techniques for treating hair loss and learn how to develop your own Hair Restoration Practice. You will acquire not only a wealth of information but also the necessary tools to be successful. You will learn to integrate his proven model for treating these patients and you will learn to generate ongoing passive income from this model. *Preceptorship training must be scheduled through Empire Medical Training, Contacting our faculty directly will void your membership. Empire offers additional products that are available to customers who have attended our workshops. Get your certification plaque for only $149 when you register for any membership. Regularly $199. All plaques are 11 x 17 , wood frame and metal insert. Access our growing library of HD recorded, professional videos. Current series includes Aesthetics (over 7 topics from Botox to Lasers), and Interventional Pain Management. We offer discounted rates to ensure that all medical professionals can attend our workshops. There is always a limited time discount available for our attendees. Please check back often to get the best deal! This Discount can not be combined with any other discounts or specials. We offer specialized workshops and training in smaller cities across the country. The courses held in these hand-selected cities offer special discounts. We've made our workshops even more available! Browse the selected cities we have chosen for you to save money.